She had her two young daughters in the bathtub and cookies baking in the oven. She opened the door and saw who was standing there, and before they could say anything she had finished the quick calculations. An injury would be a phone call. A serious injury would be a visit from soldiers in regular uniforms. Death would be dressier soldiers, in their Class As. These two, asking if they could come in, were in their Class As. “There are a few things I have to get done before you say it,” she answered. She wanted to remain in control. That was important to her. She went into the kitchen and turned off the oven, knowing she was about to forget about the cookies. She made a list. She phoned some neighbors and asked them to come over and get the girls. She phoned her mother and asked her to get on the first plane. She made sure the door to the bathroom was shut. Finally, she sat on a couch in the living room, and they stood in front of her and said it. She left the pillows as they were, and turned down the bed on that side, next to the window, and smoothed it. She carefully refolded the second blanket and laid it on the lower foot of the bed, no, it would bother his poor feet. She hung it over the footboard. She stood looking at the carefully made bed, and, for a few seconds, she was not sure where she was or why she was doing this. Then she remembered and said, “oh,” in a small, stupefied, soft voice. She opened the window, top and bottom, and when the curtains billowed she tied them back more tightly. She went to the hall closet and brought out the bedpan and rinsed and dried it and put in under the bed. She went to the medicine chest and took out the thermometer, shook it, washed it in cool water, dried it, and put it beside the bed in a tumbler of water … She pulled down the shade. She turned out the light and dropped to her knees, facing the bed, and closed her eyes. She touched her forehead, her breastbone, her left shoulder and her right shoulder, and clasped her hands. “O God, if it be Thy will,” she whispered. She could not think of anything more. She made the sign of the Cross again, slowly, deeply, and widely upon herself, and she felt something of the shape of the Cross; strength and quiet. Thank You For Your Service is a first-rate book, one you absolutely must read, but my experience was greatly enhanced having read it after A Death in the Family. I was more attuned to what Amanda Doster and the other families now endure. That’s this book’s magic, more than any academic analysis of Agee as a prose stylist could explicate. It just resonates. Not counting the tone poem that opens the novel (more on that later), it’s refreshingly direct and honest. After Jay Follet is introduced in the first part of the book — we see the special bond he has with his son Rufus and the hard-earned but genuine love he feels for his wife Mary — the rest of the story takes place when the grief is still raw and unprocessed. This isn’t to say that Agee’s writing isn’t worthy of that deep analysis; it’s more that I’m reluctant to do that kind of work. It seems beside the point. A Death in the Family is meant to be felt, not studied, a deliberately pared-down meditation on grief whose unassuming quiet is what makes it great. And so I’m happy to leave it there, the novel’s status as a classic undisputed by me, so I can steer the discussion in another, less harmonious direction. No consideration of this novel would be complete without talking about its long gestation and complicated publishing history. 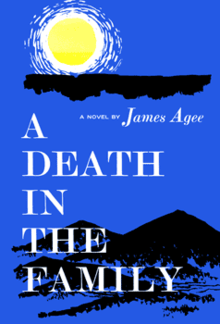 James Agee worked on A Death in the Family for 20 years, as a way to sift through the emotional wreckage left after his father’s death when Agee was a young boy. After Agee himself died in 1955, he left behind a substantial draft and working notes, which his editor David McDowell then used to piece together a finished book (with a new title). Whatever McDowell did paid off: A Death in the Family won the Pulitzer Prize in 1958, Agee’s literary reputation was finally restored in perpetuity, and the novel is now seen as a masterpiece of American fiction. Then Agee’s archives opened up in 2002, and Agee scholar Michael Lofaro spent 3 years poring over the author’s notes before publishing his own corrective, exposing McDowell’s Lish-caliber edits as more sweeping than he ever led on. The most glaring change was McDowell’s unilateral decision to include an introduction written decades before called “Knoxville: Summer 1915,” a mood piece which all parties agree was never part of Agee’s outline. It’s an impressive piece of writing and a breathless scene-setter, but even if you didn’t know that A Death in the Family was a patchwork novel, assembled later by an editor, you’d feel the introduction was airlifted in from another story. Such is the problem with Lofaro’s painstakingly-researched edition; it’s both necessary and not, worthy of inclusion in the public record but futile to replace the familiar version as the “definitive” one. Imagine if we suddenly found papers stating authoritatively that Jimi Hendrix had a different track sequence in mind for Electric Ladyland; would it really matter? We’ve had 40 years with the original. We place a high premium on artistic purity, the “director’s cut,” before other people go in and muddle it up. But Agee didn’t finish it. He spent years trying to, and he couldn’t. There is no telling what a completed version of A Death in the Family would have looked like in its purest form, so we have to take the novel on its own terms. Lofaro is to be commended for his efforts, but his version comes no closer to solving the unsolvable problem, that its creator didn’t know how to tie everything together any more than his editors have. A Death in the Family exists then as a perfectly imperfect novel, a qualified classic. But then again, aren’t they all? McDowell’s version doesn’t do anything to betray it. The scenes that vary most differently are the flashback scenes with Rufus and his father. Lofaro places them in the front of the book; McDowell inserted them as long italicized passages at the end of the first two sections. In addition to the classic Penguin paperback with the McDowell edit, I relied on two books in digging into this novel’s fraught backstory: James Agee, a critical study edited by Victor A. Kramer, which gave me Agee’s outline for his novel; and the restored version of A Death in the Family, edited by Michael Lofaro.